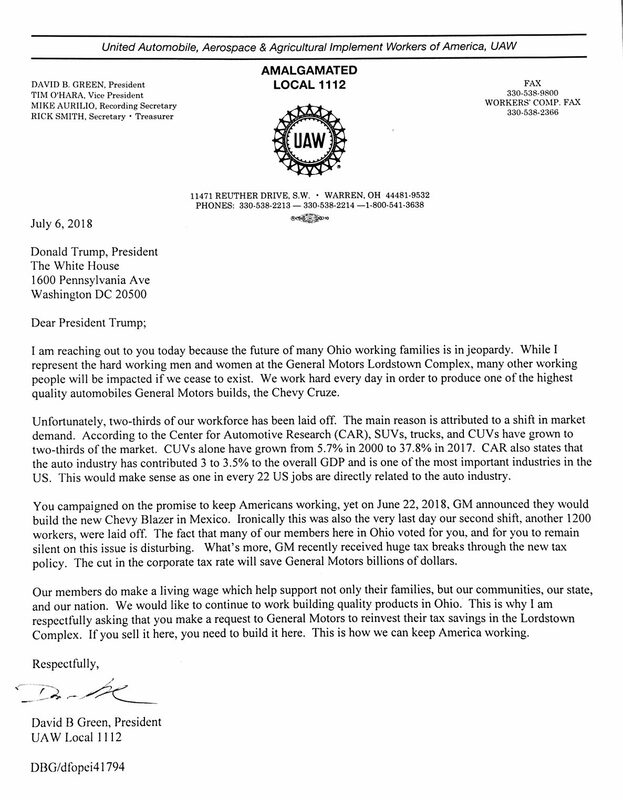 LORDSTOWN, Ohio – The president of UAW Local 1112 has made an appeal to President Donald Trump, U.S. Sen. Rob Portman and Gov. John Kasich, asking them to urge General Motors Co. to reinvest the windfall of savings from the new tax structure in GM’s Lordstown plant. 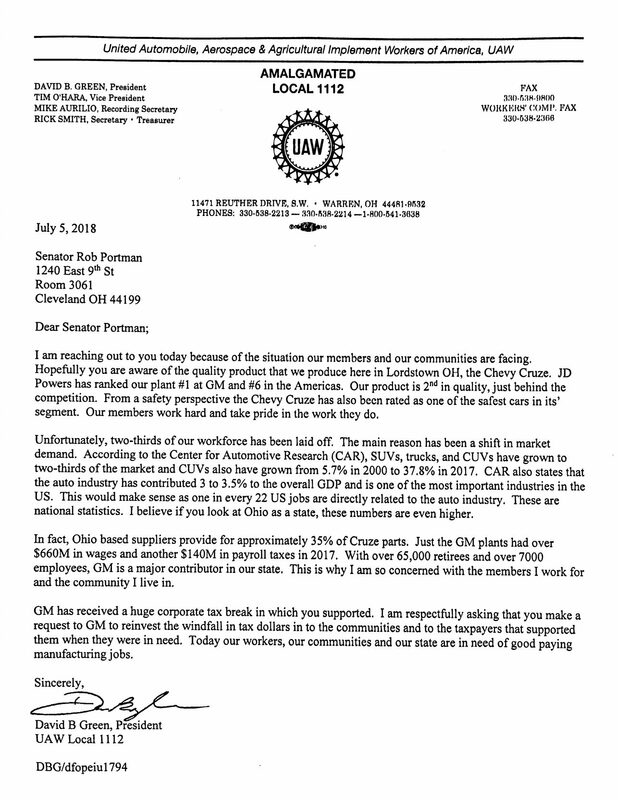 Green, the newly elected president of Local 1112, said that U.S. Sen. Sherrod Brown, D-Ohio, U.S. Rep. Tim Ryan, D-13, and several state legislators have written to GM officials expressing their concern over the latest round of layoffs at the Lordstown plant and the opportunity to reinvest there. During a press conference last week after a tour of Vallourec Star in Youngstown, Brown told reporters that he’s spoken with GM CEO Mary Barra, who told him that retooling the Lordstown plant to accommodate the Chevrolet Blazer would be too expensive. Last month, GM announced it would build the Blazer in Mexico. Moreover, Brown said that Barra would not commit to maintaining production at the Lordstown plant in the future. Last month, 1,200 workers at GM Lordstown lost their jobs when the plant was reduced to a single shift. Sales of the fuel-efficient Chevrolet Cruze have dropped significantly, as the market has transitioned from buying small vehicles to crossovers and SUVs. Green said he sent the letters – they contain almost identical language – out last Thursday and Friday, urging the president to convince GM to use the savings it would incur as a result of new corporate tax structure for reinvestment in the Lordstown plant. “We think that GM, with its billions of dollars in new tax breaks, should invest that money in America,” Green said. The letter sent to Portman can be read here, while the full letter addressed to Trump is here.